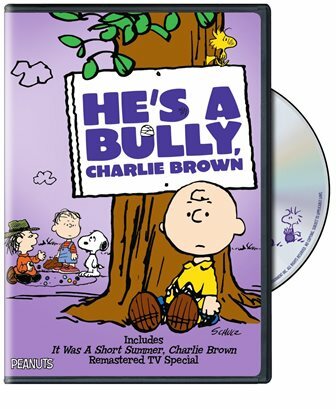 We’ve partnered with Warner Bros. Home Entertainment for a giveaway of the brand new Peanuts DVD release, He’s a Bully, Charlie Brown. Available October 6 for purchase (visit the WB Shop), this DVD set includes two classic Peanuts specials, plus one episode of The Charlie Brown & Snoopy Show. One lucky winner will receive this DVD. To enter for a chance to win, answer the easy question in the Rafflecopter form below by October 9, 2015 (U.S. residents, 18+ only, no P.O. boxes). “He’s a Bully, Charlie Brown sends a powerful message. From time to time, we’re all faced with situations in which we have to be strong, courageous and stand up for what we believe is right,” said Mary Ellen Thomas, Vice President Family & Animation Marketing. Yes, I love Peanuts cartoons! I can’t wait for the new Peanuts animated movie in November!! I can most relate to Peppermint Patty 🙂 we la la LOVE Peanuts! It’s such a wonderful, calm and wholesome show…it’s had a measurable impact on society for sure! Peanuts is a Classic. I grew up with Charlie Brown, Snoopy and the crew and now my boys are enjoying them too. I love the Peanuts gang! As a counselor, I especially hold a fondness for Lucy. Eh, honestly? Not really; I think they’re kind of fatalistic and preachy. The kiddos love them, though. Name one way you believe Peanuts – be it the comic strip, TV specials, or legume – have had a positive influence on society. I think that the TV specials brings families together! I think that the comic strip help keep life funny! I think the peanuts cartoons and tv specials are good for bringing families together. I believe they are a good influence because how they show how to handle certain situations in a caring yet funny way at times!! I think the Peanuts TV specials have helped kids to learn how to get along with their peers, even when there are disagreements. I also like that Snoopy is included, to help everyone see how great having a dog in a family can be. I think the Peanuts tv specials have always had a positive influence. They show how much kindness can bring happiness like when they save the little tree on Christmas or when Linus tells Charlie Brown what Christmas is really all about. I think that they bring families together because every generation enjoys watching/reading Peanuts.